Most photocopiers have the option of an additional piece of equipment called a finisher. Otherwise known as sorter staplers, booklet makers, saddle finishers etc. All of these finishers require packs of staples in order for them to perform their stapling function and we have sourced a complete range of 11 packs which fit most manufacturers' finisher units. 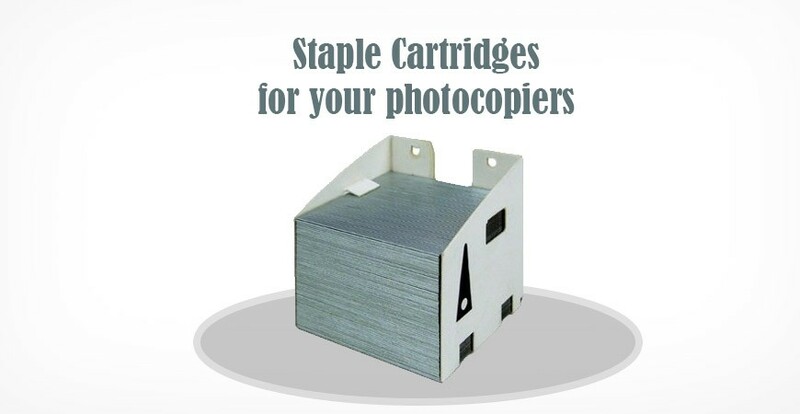 We sell staples used by the following manufacturers: Canon Konica Minolta Kyocera Mita Panasonic Ricoh Sharp Toshiba Xerox. The problem is that there are around 2000 different photocopiers and 450 finishers. Some photocopiers can accept 3 or 4 different finishers and some finishers can use 3 or more different staple types. This is due to the function they have to perform. So, how do you find what you want? Each staple pack has an OEM part number quoted in it's title. The staples may actually have up to 4 part numbers per manufacturer and, when known, these are quoted in the details page. Next is the Short Description where we state how many refills are in the box and how many staples are in each refill. We haven't counted them but we trust the figure is pretty accurate. Also in the Short Description are the dimensions of each refill. This is an extra check to make sure you are ordering the right item. The Details page confirms which finisher model numbers are appropriate for a particular pack of staples. Please note it is the finisher model number that is crucial to confirm, not the photocopier model number. I am confident that you will find your item by using the Search facility at the top right of each page. Just type any info you have such as the finisher model. Better still if you have the staple part number. Just be aware, as I mentioned earlier, that each finisher may take various staples. As a final check, the photos and the dimensions are accurate and although there might be very slight variations in the cardboard outer, you can buy them with confidence.